Defragmentation is one of those computer things that are obviously useful but hard for users to grasp. That hard to grasp part is constant stream of money for developers of numerous shareware defrag apps. Basically defragmentation is a process of putting files on hard disk in order using built-in Windows functions made for this purpose. So defragmentation software is fancy interface with minor differences in logic and schemes used to defragment. Server environment may require complex sorting and scheduling capabilities in defragmentation routines. Home user requires free program that he has to click once a week and it does everything. JkDefrag is exactly that. JkDefrag comes as few executables that do same thing with different interface. Launches defragmentation in console window. Good for scheduling and such but not interesting for home user. Same defragmentation (again) but in the form of Windows screensaver. I don’t like this one much, launching defrag every time you are away from computer is overkill. Update. Defrag via screensaver can be delayed in settings if done recently. Thanks Ky for info. Where are buttons to press? 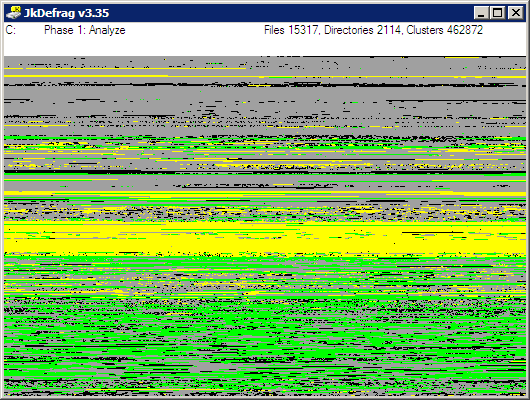 By default JkDefrag simply defragments all hard drives it sees. This behavior can be tuned with command line arguments (both command line and graphical version accept them). Figuring them out is boring so there are few 3rd party tools that make setup process easier. I use JkDefragStarter. None. This is as good as software can be. Single function and perfect execution. JkDefrag is freeware, open-source and portable. Great stuff, I currently use PerfectDisk defrag but I like lightweight console applications. I’ll give it a try! Yep, lightweight is good. :) Large fancy GUI and ton of buttons are not really needed to defragment. @Rarst: You’re always a step ahead, I was just about to write about JKDefrag in my blog…:) Anyway, back on track, I’ve been using it for a long time and IMO it’s the best defragger for Windows. The thing I like most is the detailed disk map and the fact that it’s portable. As far as the screensaver concerns, you can configure it so that it doesn’t run if you’ve recently defragged the hard drive. The default setting is set to 4 hours, but this can be changed. BTW, are the screenshots from your computer? >As far as the screensaver concerns, you can configure it so that it doesn’t run if you’ve recently defragged the hard drive. The default setting is set to 4 hours, but this can be changed. Thanks for details. :) I hadn’t poked screensaver much and it was quite a few versions ago. >BTW, are the screenshots from your computer? I’ve read more than once that continuous background defragmentation is bad idea and tend to believe that. Also IObit got itself into real trouble with Malwarebytes recently which had nearly destroyed its reputation from reactions I see online.